StrangeLoop conference really spiked my interest in learning Clojure. 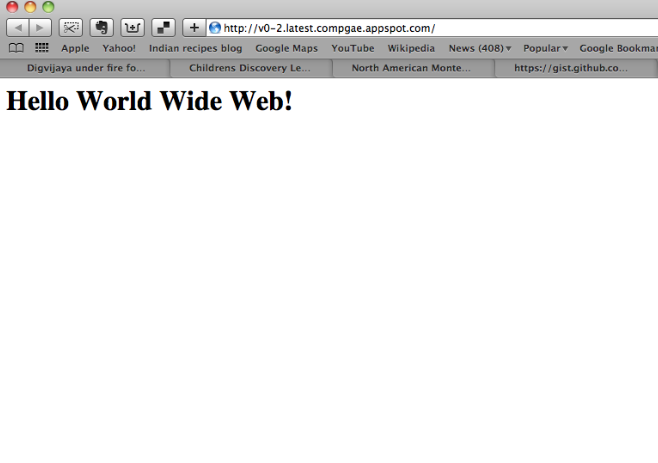 I wanted to find a way to do web development using Clojure. So this entry is primarily a how-to on setup of IntelliJ Idea to do Clojure using Compojure web framework, Leiningen build tool and Google App Engine deployment environment. Download Leiningen script file and follow instruction to put it in PATH. 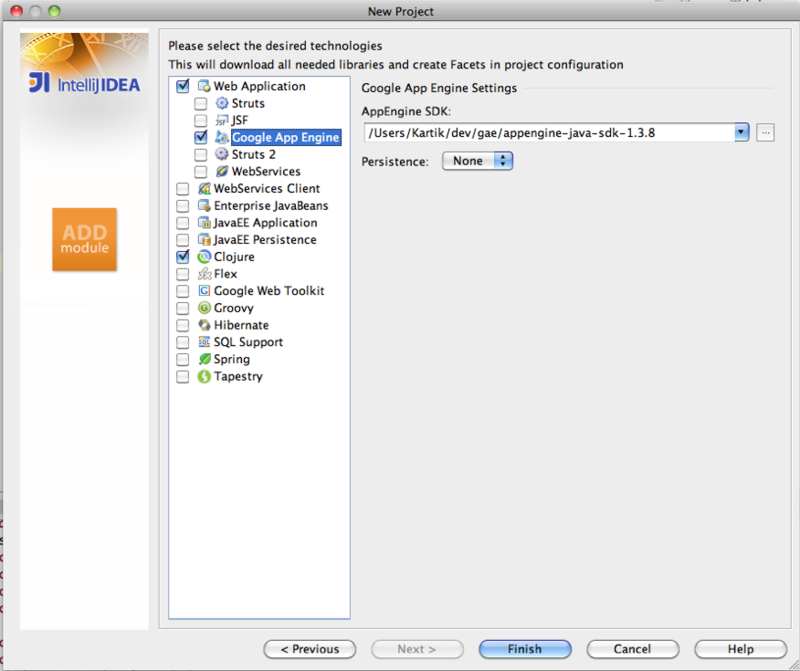 Step 2: Install "La Clojure" and "Leiningen" plugin for IntelliJ Idea. To setup Leiningen plugin properties in IntelliJ click on Preferences -> Leiningen and give the path to the executable. Now with the installation complete, we are ready to create a new project. For now the project creation is done outside IntelliJ Idea using Lein on command line. This is the only step done outside the IntelliJ Idea. Choose the folder structure where your IntelliJ workspace is. You can see that Lein created project folder structure. In the project root it created a project.clj file used by Leiningen. Under src folder, it also created default namespace by the name of the project and created a core.clj file under it. Let's create IntelliJ Project, even though project structure exists pick the same folder path that you selected in step 4. Setup the project to include Compojure and Ring libraries for development. 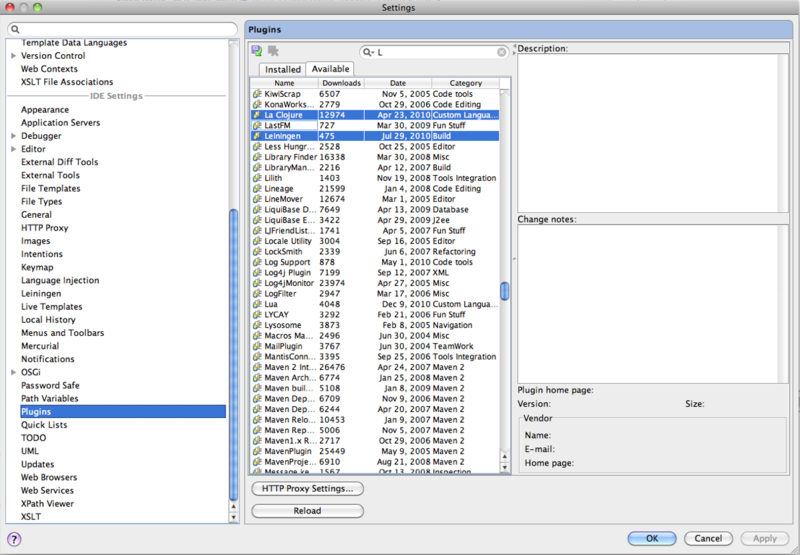 :description "Example for Compojure on GAE using IntelliJ"
From the Leiningen Tool window in Idea run following commands. To locally run click on already create "Run Configuration"
Thanks this is good, would it be possible to get the images back, since they are not showing up on the blog. I don't think you need lein-swank dev-dependency. I guess it is only useful for Emacs/Slime setup.